Challita, E.J., J.S. Najem, R. Monroe, D.J. Leo, and E.C. Freeman, Encapsulating Networks of Droplet Interface Bilayers in a Thermoreversible Organogel. Scientific Reports, 2018. 8(1): p. 6494, DOI: 10.1038/s41598-018-24720-5. Wujun Zhao, Rui Cheng, Brittany D. Jenkins, Taotao Zhu, Nneoma E. Okonkwo, Courtney E. Jones, Melissa B. Davis, Sravan K. Kavuri, Zhonglin Hao, Carsten Schroeder and Leidong Mao,“Label-free ferrohydrodynamic cell separation of circulating tumor cells”, Lab on a Chip, 2017, DOI: 10.1039/c7lc00680b. Xu, L. A. Feuerman, J. Ge, K. R. Nilsson, and M. P Fok, “Temperature-Insensitive Contact Force Sensing in Bi-Directional Catheter Using Fiber Bragg Grating Pair,” IEEE Sensors Journal, vol. 17, iss. 16, pp. 5118-5122, August 2017. Michelle Makhoul-Mansour, Wujun Zhao, Nicole Gay, Colleen O’Connor, Joseph Najem, Leidong Mao, Eric C Freeman,“Ferrofluid-Based Droplet Interface Bilayer Networks”, Langmuir, 33 (45), 13000, 2017, DOI:10.1021/acs.langmuir.7b03055. Zhao, W.; Cheng, R.; Lim, S. H.; Miller, J. R.; Zhang, W.; Tang, W.; Xie, J.; Mao, L., Biocompatible and label-free separation of cancer cells from cell culture lines from white blood cells in ferrofluids. Lab on a chip 2017, 17, 2243-2255. Razavi, M. J.; Reeves, M.; Wang, X., Mechanical role of a growing solid tumor on cortical folding. Computer methods in biomechanics and biomedical engineering 2017, 20, 1212-1222. Wingfield, J. L.; Mengoni, I.; Bomberger, H.; Jiang, Y. Y.; Walsh, J. D.; Brown, J. M.; Picariello, T.; Cochran, D. A.; Zhu, B.; Pan, J. M.; Eggenschwiler, J.; Gaertig, J.; Witman, G. B.; Kner, P.; Lechtreck, K., IFT trains in different stages of assembly queue at the ciliary base for consecutive release into the cilium. Elife 2017, 6. E26609. Zhaojie Deng, Sam Arsenault, Cristian Caranica, James Griffith, Taotao Zhu, Ahmad Al-Omari, Heinz-Bernd Schüttler, Jonathan Arnold, and Leidong Mao,“Synchronizing stochastic circadian oscillators in single cells of Neurospora crassa”, Scientific Reports, 6, 35828, 2016, DOI: 10.1038/srep35828. Zhao, Wujun; Zhu, Taotao; Cheng, Rui; Liu, Yufei; He, Jian; Qiu, Hong; Wang, Lianchun; Nagy, Tamas; Querec, Troy D.; Unger, Elizabeth R.; Mao, Leidong, Label-Free and Continuous-Flow Ferrohydrodynamic Separation of HeLa Cells and Blood Cells in Biocompatible Ferrofluids. Advanced Functional Materials 2016, 26, 3990-3998. Zhao, Wujun; Cheng, Rui; Miller, Joshua R.; Mao, Leidong, Label-Free Microfluidic Manipulation of Particles and Cells in Magnetic Liquids. Advanced Functional Materials 2016, 26, 3916-3932. Zhaojie Deng, Sam Arsenault, Leidong Mao, Jonathan Arnold, “Measuring synchronization of stochastic oscillators in biology”, Journal of Physics – Conference Series, 750, 012001, 2016. Taylor, A.; Miller, M.; Fok, M.; Nilsson, K.; Tse, Z. T. H., Intracardiac Magnetic Resonance Imaging Catheter With Origami Deployable Mechanisms. J Med Devices 2016, 10, 20957-20958. Logun MT, Bisel NS, Tanasse EA, Zhao W, Gunasekera B, Mao L, Karumbaiah L., Glioma Cell Invasion is Significantly Enhanced in composite Hydrogel Matrices Composed of Chondroitin 4- and 4,6-Sulfated Glycosaminoglycans. Journal of Materials Chemistry-B 2016, accepted. Deng, Z, Arsenault, S., Mao, L., Arnold, J. , Measuring synchronization of stochastic oscillators in biology. Journal of Physics: Conference Series 2016, accepted. Deng, Z., Arsenault, S., Caranica, C., Griffith, J., Zhu, T., Al-Omari, A., Schuttler, H-B., Arnold, J., Mao, L. , Synchronizing stochastic circadian oscillaotrs in single cells of Neurospora crassa. Scientific Reports 2016, in revision. Mir Jalil Razavi, Mary Reeves, Tianming Liu, Xianqiao Wang, Effect of a Growing Solid Tumor on the Cortical Folding of the Fetal Brain. RSC Advances 2016, accepted. Li Xu, Matthew Miller, Jia Ge, Kent Nilsson, Zion Tse, Mable P. Fok, Temperature Insensitive Fiber Optics Contact Force Sensor for Steerable Catheters. IEEE Sensors Journal 2016, 16, 4771-4775. Morgan DaSilva, Kevin J. Wu, T. Stan Gregory, Jonathan R. Murrow, Zion Tsz Ho Tse In Hemodynamic Quantification with Magnetohydrodynamic Voltages through a Flow Phantom, Biomedical Engineering Society (BMES) Annual Meeting, Minneapolis, Minnesota, USA, 2016. Logun MT, Bisel NS, Tanasse EA, Zhao W, Gunasekera B, Mao L, Karumbaiah L. In Glioma Cell Invasion is Significantly Enhanced in composite Hydrogel Matrices Composed of Chondroitin 4- and 4,6-Sulfated Glycosaminoglycans, Biomedical Engineering Society (BMES) Annual Meeting, Minneapolis, Minnesota, USA, 2016. Leah Feuerman, Austin Taylor, Zion Tsz Ho Tse In MRI Guided Endoscope Based on Disposable Origami Design, Interventional Magnetic Resonance Imaging, Baltimore, Maryland, USA, 2016. Leah Feuerman, Austin Taylor, Mable Fok, Zion Tsz Ho Tse In Origami Endoscopic Design for Minimally Invasive Surgery, Biomedical Engineering Society (BMES) Annual Meeting, Minneapolis, Minnesota, USA,2016. Lauren Mehanna, Megan Logun, Wujun Zhao, Leidong Mao, Lohitash Karumbaiah In Synthesis of Fe3O4 nanoparticles and quantification of nanoparticle uptake in U87MG-EGFP glioma cells and primary astrocytes, Biomedical Engineering Society (BMES) Annual Meeting, Minneapolis, Minnesota, USA, 2016. Kylie Balotin, Meghan Logun, Lohitash Karumbaiah In Live Cell Tracking of U87MG-EGFP Glioma Cells Encapsulated in 3D Biomimetic Hydrogel Scaffolds, Biomedical Engineering Society (BMES) Annual Meeting, Minneapolis, Minnesota, USA, 2016. 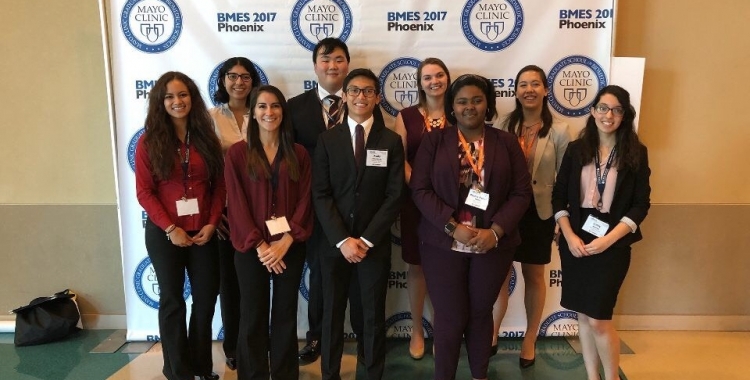 Kaylee O’Connor, Marcus Goudie, , Priyadarshini Singha, Jennifer McCarty, Ramana Pridaparti, Hitesh Handa In Preventing Infection in Silicone Based Medical Devices Using NO Release, Biomedical Engineering Society (BMES) Annual Meeting, Minneapolis, Minnesota, USA, 2016. Jordan Verplank, Luke J. Mortensen In PEGylation of Mesenchymal Stem Cells to Reduce Cell Adhesion, Biomedical Engineering Society (BMES) Annual Meeting, Minneapolis, Minnesota, USA, 2016. Emily Lindberg, Liuyang Zhang, Shiyi Zhou, Jin Xie, Xianqiao Wang In Role of Nanoparticles’ Mechanical Stiffness in Cellular Uptake Biomedical Engineering Society (BMES) Annual Meeting, Minneapolis, Minnesota, USA, 2016. Courtney R. McClure, Holly A. Kinder, Emily W. Baker, Franklin D. West In Effect of GFP Expression and DiR labeling on DiR Fluorescence and Cytotoxicity of iNSCs In Vitro, Biomedical Engineering Society (BMES) Annual Meeting, Minneapolis, Minnesota, USA, 2016. Courtney Jones, Wujun Zhao, Leidong Mao In Microfluidic Enrichment of Breast Cancer Circulating Tumor Cells based on Ferrohydrodynamics, Biomedical Engineering Society (BMES) Annual Meeting, Minneapolis, Minnesota, USA, 2016. Colleen O’Connor, Michelle Mansour, Xianqiao Wang, Eric Freeman In Characterization of Nanoparticle-Membrane Interaction through Cell Membrane Model Platform, Biomedical Engineering Society (BMES) Annual Meeting, Minneapolis, Minnesota, USA, 2016. Awa Bakayoko, Brittany Jenkins, Rupali Hire, Melissa Davis, Cheryl Gomillion In Characterization of Breast Cancer Metastasis using a Two-Dimensional and a Three-Dimensional Assay, Biomedical Engineering Society (BMES) Annual Meeting, Minneapolis, Minnesota, USA, 2016. Mary Reeves, Mir Jalil Razavi, Xi Jang, Tianming Liu, Xianqiao Wang In Effects of the growth of a fetal brain tumor on the cortical folding pattern, 6th International Conference on Mechanics of Biomaterials and Tissues Waikoloa, Hawaii, USA, 2015. Gay, Nicole; Wang, Xianqiao; Freeman, Eric In Characterization of Superparamagnetic Iron Oxide Nanoparticle-Lipid Bilayer Interactions, Biomedical Engineering Society (BMES) Annual Meeting, Tampa, Florida, USA, 2015. Deng, Z., Arsenault, S., Zhu, T., Cheng, R., Griffith, J., Arnold, J., Mao, L. In Single cell measurement on the biological clock by microfluidics, 18th International Conference on Miniaturized Systems for Chemistry and Life Sciences, San Antonio, Texas, USA, 2014. Austin Taylor, Matthew Miller, Mable Fok, Kent Nilsson, Zion Tsz Ho Tse In Microfabrication of MRI-guided Catheterization and Imaging Tools, International Society of Magnetic Resonance in Medicine, Singapore, 2016. Austin Taylor, Matthew Miller, Mable Fok, Kent Nilsson, Zion Tsz Ho Tse In Intra-cardiac Magnetic Resonance Imaging Catheter with Origami Deployable Mechanisms, Design of Medical Devices conference, Minneapolis, Minnesota, USA, 2016. Valerie Helms, Mac White, Marcus Goudie, Dr. William Kisaalita, Dr. Hitesh Handa In Effects of Biopolymers and Nitric Oxide Release on Hep G2 Liver Cells, Biomedical Engineering Society (BMES) Southeast Conference, Raleigh, North Carolina, USA, 2015. Tanasse EA, Logun MT, Bisel NS, Zhao W, Gunasekera B, Mao L, Karumbaiah L. In Design and Fabrication of a Microfluidic Device for the Live Imaging of Cells Encapsulated in Biomimetic Hydrogel Scaffolds, Biomedical Engineering Society (BMES) Southeast Conference, Raleigh, North Carolina, USA, 2015. Mary Reeves, Mir Jalil Razavi, Xi Jang, Tianming Liu, Xianqiao Wang In Effects of the growth of a fetal brain tumor on the cortical folding pattern, Biomedical Engineering Society (BMES) Southeast Conference, Raleigh, North Carolina, USA, 2015. Jordanna Payne, Seth Andrews, Luke Mortensen, Steven Stice In BMP-2 production in mesenchymal stem cells transduced with both dummy and BMP-2 vectors, Biomedical Engineering Society (BMES) Southeast Conference, Raleigh, North Carolina, USA, 2015. Ishmael Rogers, Paul Cray, Andrew Martin, Cheryl Gomillion, Jason Locklin In 3D-Printed Polymer Constructs for Osteochondral Tissue Regeneration (First place award), Albany State University’s 4th Annual Regional Undergraduate Research Symposium, Albany, Georgia, USA, 2015. Elizabeth Gianino, Marcus Goudie, Cheryl Gomillion, Hitesh Handa In Assessing the Potential of Nitric Oxide Releasing Polymers on Bone Regeneration, Biomedical Engineering Society (BMES) Southeast Conference, Raleigh, North Carolina, USA, 2015.